If you’ve read my pocket guide to English grammar rules you would know how important comma placement is. Correct punctuation isn’t rocket science, you can easily master it with the help of free proofreader tools. In fact, the best tool in my writing arsenal corrects over 400+ grammar and punctuation errors while you write, in real-time. If comma issues have got you stressed I’ve got you covered! Your search for free comma checkers ends here! Are comma splices and run-on sentences making it difficult for you to go through your essays and paper writing? Comma splices and run-on (or fused sentences) sentences are the most common punctuation errors that show up in your writing. In this article, I’ll show you the top best comma checker tools that will make your comma placement a lot easier. First, let’s discuss what these grammar & punctuation errors mean how you can avoid comma errors using our free comma corrector tools. A missing coma or an extra comma can give your writing a whole different meaning thereby ruining your whole article. Use commas when attributing quotes, and so on. It’s not always possible to remember those complex comma splice rules. A single punctuation error can reduce your scores, add a different meaning to your script and ruin your reputation as a writer (being a writer, I can safely say that correct grammar is your best friend to getting new writing clients). This becomes worst, if you’re a teacher or a blogger and make common grammar mistakes like missing a comma. We all make mistakes, but the smartest of us use tools and techniques that help us write fluent English with flawless grammar. Having a handy online punctuation checker tool that corrects comma mistakes is the best thing you can ask to increase your grammar skills. That’s why, I present to you top 7 of my best online comma checker tools that are free. Most of these don’t require you to download anything and better yet, they save you from that comma misplacement embarrassment. Grammarly is by far the best grammar and punctuation tool I’ve ever used. Grammarly is a free chrome extension that sits on your browser and corrects all the possible grammar and spelling mistakes in your writing. It also offers the best plagiarism checker tool that is so efficient that it’s the most favorite tool to avoid plagiarism and professors alike. 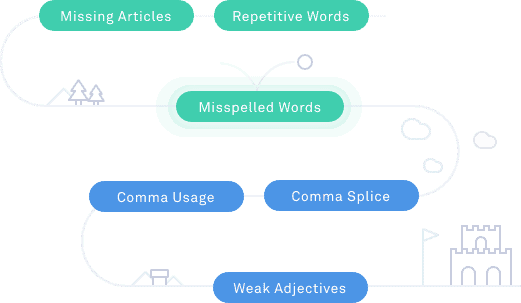 A tool used by millions of students, bloggers, professional writers, teachers, Grammarly corrects over 400+ grammar mistakes, polishes your writing to remove any punctuation mistake and enhances clarity and meaning of your text. Another important benefit of Grammarly as your comma checker tool is that, it not only helps you with correct comma usage, but also acts as your online proofreading tool and helps you improve vocabulary by helping you choose synonymsand avoid jargon. It offers by far the best style suggestions (based on what content you write like script, academic writing, medical trans business proposals, web blog posts to name a few). Grammarly helps you write mistake-free emails, social media updates (Facebook, LinkedIn, Tumblr etc) and is also available as iOS and android punctuation checker apps to make great writing on the go. If you want a free tool to get rid of comma splices and run on sentence errors, having Grammarly as your writing tool (or essay checker) is the only recommendation I can give. Grammar Cheat Sheet: Free Downloadable grammar rules PDF book. WhiteSmoke’s punctuation checker is another efficient grammar and punctuation checker tool that not only detects and checks your comma usage, but also acts as a great spell checker and text style checker tool. WhiteSmoke’s efficient comma splice checker tool suggests you to add a space after the comma and not before it (a common mistake with commas) and other intricate errors that the human eye might miss easily. If you’re a student or a college goer, Whitesmoke comma placement checker is a must-have tool in your writing arsenal. Whitesmoke’s doesn’t limit itself to just checking spellings and punctuation marks, it provides you over 100 CV and email templates to make sure you get that dream job. It does include a plagiarism checker tool and translator tool that helps you translate your document to other languages. If you’re looking for the best punctuation tool, I’d say Grammarly and WhiteSmoke both give each other a run for their money. Choose what you’re comfortable with. Or you can choose from these WhiteSmoke alternatives too. Ginger software is another free online grammar and punctuation checker tool. It’s one of the best free comma checker tools I use to check my commas. With Ginger software, you can correct the sentences with answers and suggestions to add appropriate synonyms, idioms, remove wordiness etc. Ginger software comes with inbuilt translator helping you translate your text in up to 40 languages and claims to boost your writing productivity. Ginger’s grammar and text corrector tool is top notch and comes second to no one except Grammarly (as far as I’ve used). The only issue I didn’t like about Ginger punctuation checker is, you have to download the software and install it on your computer to use it unlike Grammarly which instantly corrects every text you write, no matter on your computer or on mobile. Best free plagiarism checker tools you should download now! ProWritingAid describes itself as the essential editing tool for academic writers, business writers & fictional writers. It has a very efficient tool that becomes your favorite comma usage checker tool as soon as you use it. It has a very good algorithm that sniffs the slightest of grammar and punctuation mistakes like comma splices also sufficing as a run on sentence checker and apostrophe checker. If you’re into writing manuscripts, or fictional literature, ProWritingAid is a free editor to help you reduce mistakes and write better copy, every time. ProWritingAid does have a paid version that is affordable as compared to other premium punctuation checker tools out there. With ProWritingAid’s 20 types of editing reports (which act as your personal passive voice checker, sentence length and structure checker etc) you’d hardly need to worry about crappy script. Read my detailed ProWritingAid review to discover how it can better help you. IMPORTANT: If you’re getting the much-deserved ProWritingAid for you, make sure to avail your ProWritingAid coupon of 25% OFF. Confused about which word is appropriate for your assignment or article? ProWritingAid comes inbuilt with word explorer and contextual thesaurus helps you find the right words that fit the context of your writing project. Needless to say, ProWritingAid’s plagiarism checker tool (making it a top Copyscape alternative) is one of the best in the market. ProWritingAid is the only grammar and punctuation checker tool with Google Docs support. So, if you do a lot of writing in Google docs, you might want to give ProWritingAid a try! Keep reading and you’ll find out 3 more free comma checkers you’ll love! After the deadline is another free and popular punctuation and comma checker tool that is available both online and for download. After the deadline is powered by powerful AI and natural language technology that finds almost all your writing errors and helps you write flawless copy. It’s also available as a WordPress plugin in case you wanted a WordPress grammar checker plugin to aid your blog post writing process. It’s free for personal use with unlimited Grammar and comma correction, style suggestions and other punctuation checking features. After the deadline does support other languages so if you’re looking for an effective comma checker tool for Spanish, French, or German, After The Deadline has got your back covered. Online correction is another minimalist grammar and text corrector tool that does a good job correcting your basic punctuation mistakes like misplacement of commas, apostrophes, and semi colons. Online correction is an efficient comma splice checker tool for all of those who Google “punctuate this sentence for me online” a lot. Another cool feature is, Online Correction’s auto-correct feature. 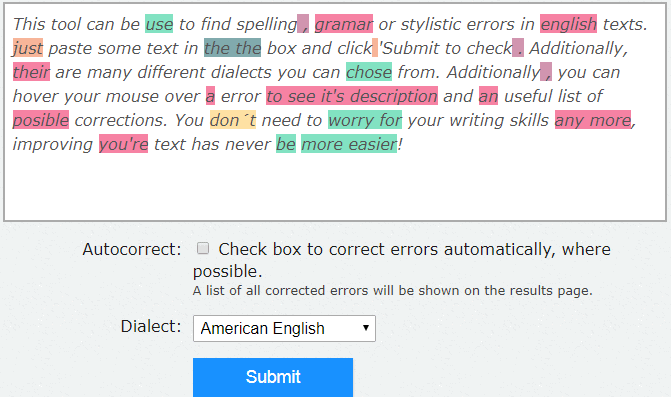 Online correction’s comma checker tool also does offers you to correct your text based on the dialect. You can choose to select your dialect between American English, British English, Australian English, South African English, to name a few. Garretson’s punctuation checker is a very minimalist punctuation checker tool that can be used to check comma placement errors. It is a free comma checker online and handy tool that doesn’t need you to download anything or install any extension. You just need to copy the text from your favorite text editor and paste it their to find grammar and punctuation errors. In my honest opinion, this is a very simple tool that does a decent job if you’re going to need something on the go. If you need a punctuation checker tool only once in your life, use this and get the job done. If you’re a student or in a profession where you need a consistent writing tool, I’d suggest one that helps you check and edit punctuation mistakes as you write. That’s when you need to reliable comma checker tool like Grammarly or Ginger or Whitesmoke. I hope you liked our list of best free comma checker tools. While it is always good to remember the grammar rules, it is smart to use tools that can take the burden of punctuation correction, worry about comma placements etc off your shoulders so that you focus on writing productively. In the above list of comma splice checkers or comma punctuation checkers as a whole, we love (and use) Grammarly as our go to tool. Best Free Comma Splice Checker Tool in 2019? 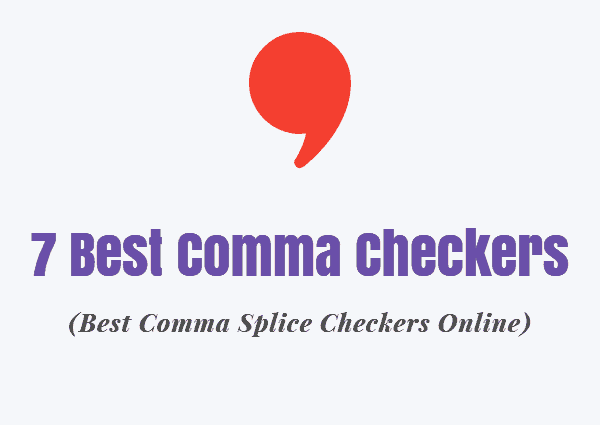 Looking for the best comma splice checkers? Grammarly is free, goes anywhere with us (even on mobile) and does much more than what other provide even at a higher rate. Needless to say why more than 10 million students and professionals trust their writing with Grammarly. Let us know what’s your preferred comma checker tools? Comment below your favorite grammar and comma hacks and win a chance to be featured on our blog. If you liked this post, do share it on your favorite social media platform. Thank you!